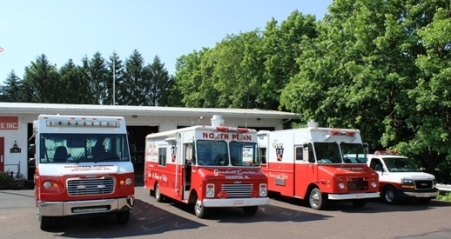 We are an emergency canteen service located in Souderton, Montgomery County, Pennsylvania although we serve a five-county area in Southeastern Pennsylvania. We have been in operation since 1949. Take a few minutes and look around and if you have any suggestions or comments, please contact our webmaster via the Contacts Page. As a totally volunteer organization, we welcome donations from the public as well as the people we serve. We have an annual public fund drive which covers residences in our immediate geographical area although we physically cover a five-county area (Montgomery, Bucks, Chester, Lehigh, Northampton) as well as an occasional call beyond that range. If you would like to donate, please go to our contact page for our address. We are a Charitable Organization under §501(c)(3). Below you will find our Mission Statement. Thank you. The purpose of the North Penn Goodwill Service, Inc. is to provide hot food, hot and cold drinks, temporary shelter from the elements, and a restroom facility to emergency workers including police, firefighters and rescue personnel. We are dispatched upon emergency personnel’s request, to emergency scenes via the Montgomery County, Pennsylvania, Emergency Dispatch system on a 24/7/365 basis. While on the scene, we prepare food and drinks for the emergency responders as well as victims of any disaster as requested by those who summoned us. We are a totally volunteer organization relying upon donations of those we serve and the generosity of suppliers. If you would like information pertaining to joining our organization, please click here to go to the Members page and scroll down to the information on applications available online. We encourage you to contact us should you have any questions.